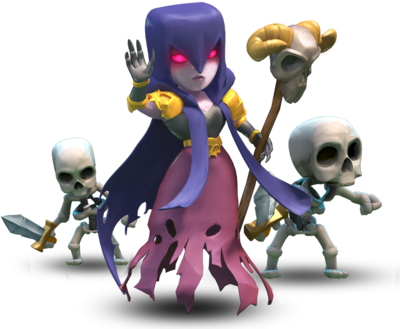 The Witch is one of many Dark Troops in the Clash of Clans game. 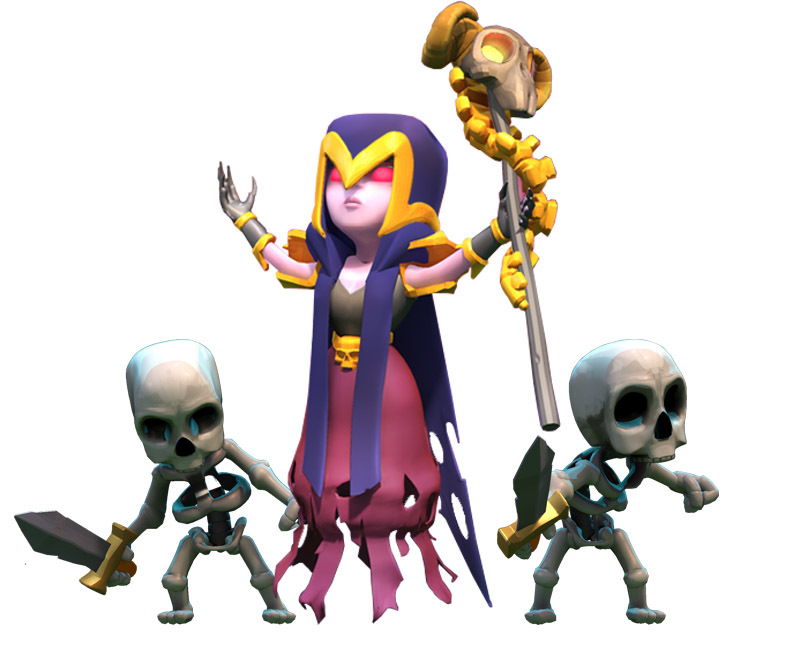 The Witch is a powerful troop that can summon dead warriors from past battles (Skeletons). She can be used as a support troop (similar to the way the Healer works) and when used correctly, can wipe a battlefield with ease. The Witch has short purple hair that goes down to her shoulders. She wears two golden shoulder pieces, a golden belt, and a raggedy skirt. She also wears a raggedy purple cape and holds a staff with a goat’s skull. Witchs have no preferred target when attacking; they will simply attack the closest building to them. However, once they become aware of enemy Clan Castle troops, Heroes or Skeleton Trap skeletons (either by being attacked themselves or being near another friendly Troop under attack), they will leave their previously targeted building and engage the enemy Troops instead. Once all of the nearby enemy Troops are defeated, they will proceed to attack the nearest building from their current location. Description of common tactics of usage a Witch on a battlefield is Here. At levels 1 and 2, the Witch has a magenta dress with slightly crumpled ends and a few holes. She carries a staff capped by the skull of a ram with golden horns. Her hair is purple and goes down almost to the bottom of her dress. She appears to be carrying a walking stick. At level 3, the Witch gains a golden headdress. Her dress loses the holes and smoothes itself out. Her staff gains two golden rings around the handle. The Witch has approximately the same amount of health as a Wizard of similar level. Although she appears to have no feet, which makes it seem like she is levitating, she is actually a ground troop and will not be attacked by Air Defenses. In terms of health and damage output, the Skeletons that the Witch summons are slightly stronger than a level 6 Archer. However, the Skeletons have no ranged attack. In the Japanese language setting of the game, the Witch is called “Necromancer” literally. Necromancy is a form of magic involving communication with the deceased – either by summoning their spirit as an apparition or raising them bodily. You can have a maximum of 20 Witches at one time in a complete set of fully upgraded Army Camps. This number increases to 22 if you include the 2 that can fit into a level 4 or higher Clan Castle. Only a certain amount of Skeletons per Witch can be on the battlefield at the same time (see table below for details). Although summoned Skeletons look very similar to Wall Breakers, they are more likely to be Barbarians because they have a similar look, stance and attacking style. If you observe carefully, the Witch looks similar to the Archer, only much more “zombified“. Witches don’t require any graves on the battlefield to summon skeletons. Rage Spells don’t speed up the Witch’s Skeleton production. When summoning Skeletons, the Witch glows green and raises her scepter. The summoned Skeletons make upon-death skeletons. 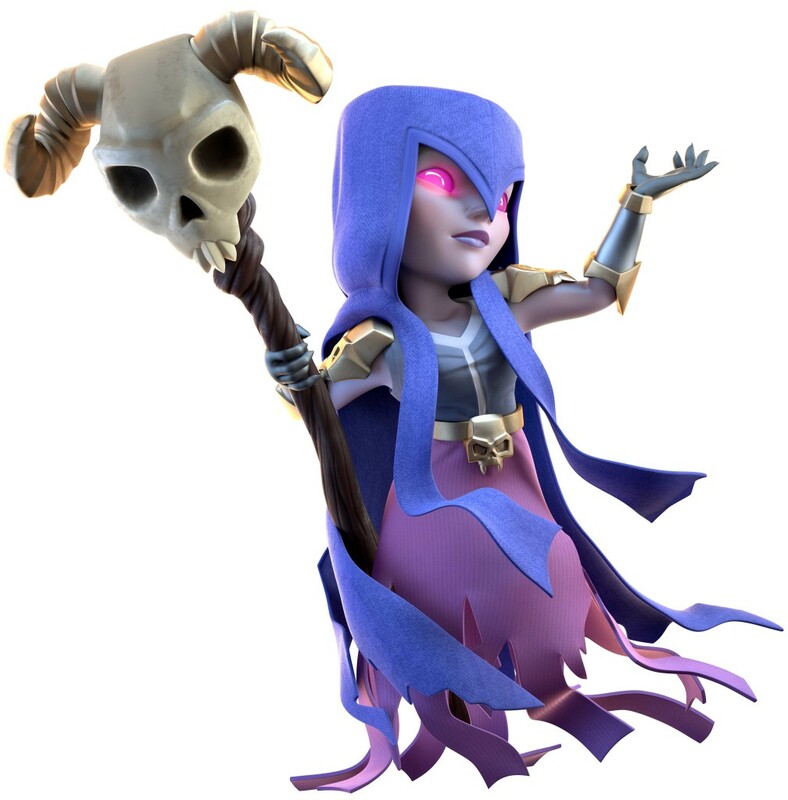 The Witch is the only troop that can be maxed out at the Town Hall level that it is unlocked. It is unlocked at Dark Barracks level 5, which requires Town Hall level 9, and can be upgraded with a level 7 Laboratory, which also requires Town Hall level 9. The witch has the fastest attack speed of any troop. 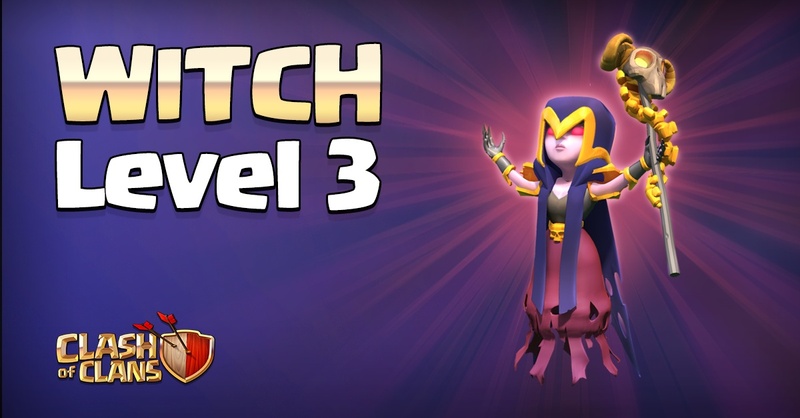 Witch level 3 was added to the game in the 10 December 2015 (Town Hall level 11) update.